A few weeks ago, I noticed strange patches of dry, scaly skin popping up all over my face and legs. I can deal with ugly patches of skin, except these itched like a son of a b! I tried to get by with over-the-counter creams and a promise to myself I wouldn’t scratch, but that failed miserably. With the patches now inflamed, I finally scheduled an appointment with the dermatologist. She took one look at my skin and said, You’ve got eczema. I wasn’t surprised, yet I was. I knew my symptoms pointed to eczema, but I never had it before that I remember. I proceeded to learn more about the skin condition, and I decided to share some of what I learned with you. 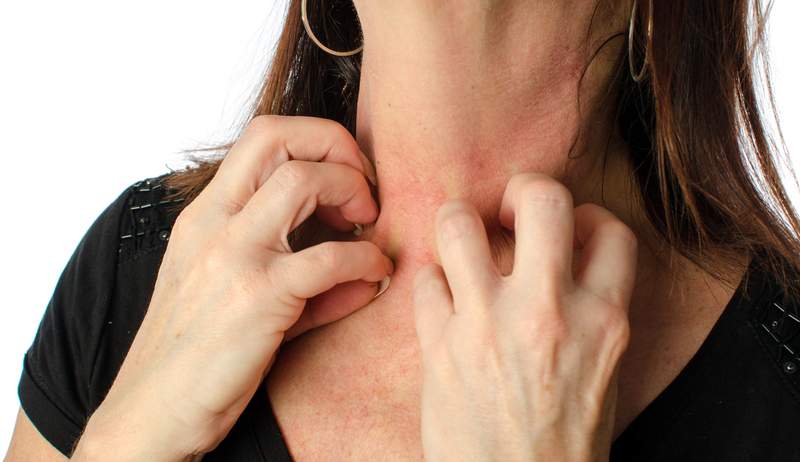 Eczema is actually a general term describing many types of rash-like skin problems. The most common type of eczema is atopic dermatitis, or AD, and the terms are often used interchangeably. AD is a common, chronic inflammatory skin condition that most often affects children, but can occur in adults as well. It is estimated that 17.8 million Americans suffer with AD. Ninety percent of cases are diagnosed in children before the age of 5, and 65 percent are diagnosed in children before their first birthday. Only five percent of AD begins in adulthood. It is more common in people who live in urban areas and dry climates. The signs and symptoms of eczema are not the same for everyone, and it can appear differently in children and adults. In general, though, it begins as a rash with areas of dry, itchy skin. 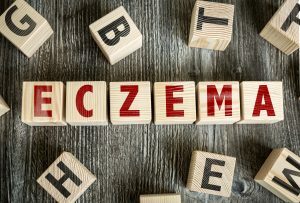 Eczema can appear anywhere on the body, but some of the more common sites include the face, neck, inside the elbows, behind the knees, and on the hands and feet. I can attest to just how itchy the skin with eczema becomes; it’s absolutely maddening! However, scratching can lead to redness, swelling, cracking, crusting, scaling and thickening of the skin. You might even get some oozing of clear fluid from the patches you’ve scratched. Ultimately, this can lead to infection of the skin. 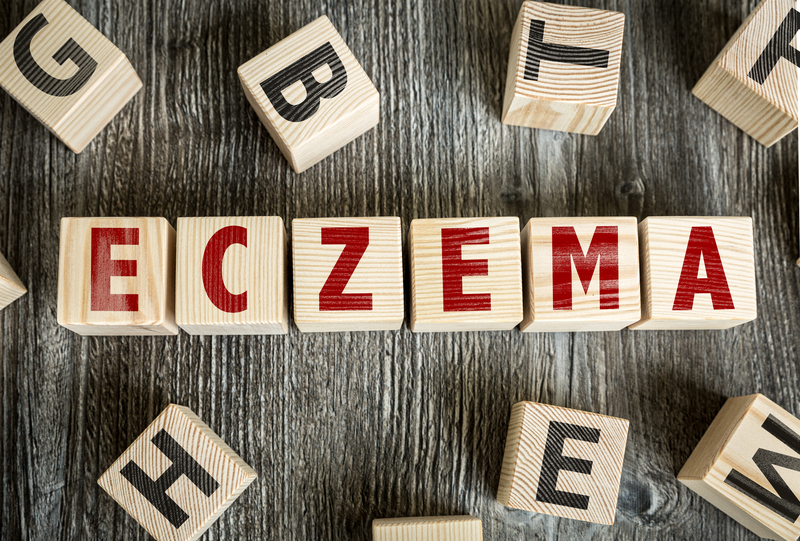 An exact cause of eczema is not yet known, but through studies, researchers have learned a few key things about the disorder. For one thing, it’s not contagious. You can’t spread it to others or catch it from someone else. It has also been discovered that genetics plays a part in the development of eczema. People who get it usually have family members who have it or have asthma or hay fever. While they don’t cause eczema, certain foods and allergens can trigger flares of the disorder or make an outbreak worse. My sister has eczema and she can’t eat anything made with tomatoes. Another trigger is winter weather when the furnaces are on and the heaters in our cars are blowing. This heat dries the air and the skin, playing a role in eczema. Stress has been found to be a contributing factor as well. There is no test to diagnose eczema. Your dermatologist can generally make the diagnosis based on the appearance of your skin and your description of your symptoms, as well as your family history. There is no cure for eczema, but there are treatments to control it. The goals of treatment are to treat infection; calm inflamed, itchy skin; prevent worsening; and avoid future flare-ups. Your doctor will develop a treatment plan based on your specific condition. He or she may recommend skin creams or ointments, like corticosteroids, to calm the itching and control swelling. Recently, the FDA approved a new prescription ointment called Eucrisa to reduce the itchiness and inflammation of eczema. Other treatments may include a topical antibiotic to treat any infection present and a recommended skin care regimen that helps heal the skin and keep it healthy. You’ll also be told to avoid anything that triggers your eczema symptoms. In more severe cases, eczema can be treated with a specialized light therapy in your dermatologist’s office. Keep your skin moist. Try using a humidifier in your bedroom to moisten the air when you sleep. Apply body lotion right after you bathe or shower. Take lukewarm baths and put small amounts of baking soda, bath oil or colloidal oatmeal into the water to moisturize your skin and reduce itching. Know your triggers. Eczema triggers may be certain foods, as in my sister’s case, or it may be detergents, soaps or deodorants you use. It may even be pet dander. If you know what gets the ball rolling for you, you can take steps to avoid these triggers. Stay away from the offending foods, use products for sensitive skin, and limit time with your pets. Don’t scratch your skin. This sounds simple enough, but unless you’ve got eczema you can’t know how difficult this can be. Keep in mind scratching an itch is a temporary solution. And it can lead to bigger problems, including skin thickening, oozing and infection. If you follow your doctor’s treatment plan and keep your skin moisturized, it will help ease the itch and lessen the urge to scratch. Manage your stress. Stress can contribute to eczema, so learning healthy ways to cope with stress can reduce your risk for a flare up. If you have a lot of stress in your life, consider a stress-relieving activity such as yoga, aromatherapy, massage therapy or meditation. Soaking in a warm bath may also help ease tension, and moisturize your skin at the same time. If you can’t manage stress on your own, seek professional help. I’m treating my eczema now, and I’m hopeful. I believe stress is a factor in my case, so I think I deserve a little massage therapy on top of the treatments my doctor prescribed. I guess I’ll have to make a massage appointment real soon!